Hi everyone, Nicky here, calling in from Kitchen Sanctuary with a recipe to use up your Christmas leftovers! 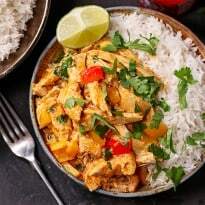 This Turkey Thai Curry is the perfect weeknight meal that is a delicious way for using up that leftover turkey. A 20-minute savory dinner dish that you can have ready to serve your family in a hurry. 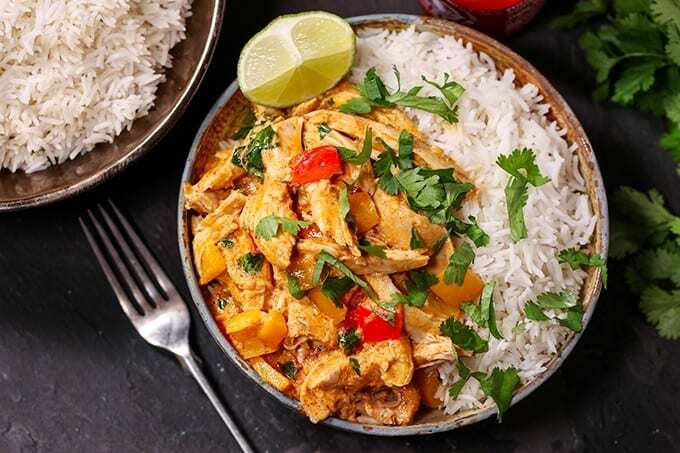 Rich Thai curry paste, red and green peppers, lemongrass paste, and leftover turkey come together for the best Thai curry recipe. Pair with tender rice, and you have an easy turkey curry dish. We all see those leftover turkey loaded sandwiches, casseroles, or pot pie recipes feeding into our social feeds. But, step out of the box and try this Thai turkey curry. It will breathe a breath of fresh air into your dinner, and truly make you not feel like you are eating leftovers. When I go to make Thai curry, I will reach for a store-bought paste. On occasion, you will find I make my own. I see that the results are so similar, that the choice is up to you on which you prefer. For me, sometimes buying store bought paste allows me less time in the kitchen, which is a massive win for me on those busy weeknights. I like to use ‘Thai Taste’ or ‘Blue Dragon’ red Thai curry paste for this, but they do have a bit of heat to them. If you’re making this for kids or others who don’t like their food too spicy, then I’d suggest using a mild Indian paste – such as Patak’s Tikka curry paste. Sounds a little strange to use an Indian-style paste in a Thai curry, but it does taste great. I’ve added peppers to my leftover turkey curry, but if you’ve got other leftover cooked or un-cooked vegetables then throw them in. Brocolli and green beans work well, but I’d even go so far as throwing a couple of leftover roast potatoes in (Massaman curry has potatoes in after all!). If they’re already cooked, just add them for the last few minutes of cooking. You will find that a red curry most generally offers less heat than the green curry recipes. Now if you go to the west, you will see that the red curry is way spicier, and the green curry is a bit more mellow. So, depending on where you live, will depend on the variance of how they traditionally make curry. My Turkey Thai Curry does pack some heat factor. I use a red curry paste for this recipe. So it does pack that spicy flavor paired with the bit of sweet. It is a nice blend of sweet and spicy. Reach for an Indian Tikka paste to replace the red curry paste. This can help lessen the heat but still give you the warmth that you are used to in curry. When you count the lean turkey meat next to the vegetables, it makes for a great base of a healthy meal. But, because of the full-fat coconut milk being used, and serving over rice, it can add in some fat and calories you need to take into account. You can reach for cauliflower rice to serve for a lower carb option. This will cut out some carbs from the white rice. Start by grabbing a large skillet. Add in your chopped red and yellow peppers. Cook on a medium heat setting for around two minutes to help tenderize the peppers. Next, you want to add in your garlic, ginger, and lemongrass paste along with your pre-cooked turkey. Stir for a minute and then add in your curry paste. Allow the curry paste to mix in with the turkey and veggies. Allow the curry to cook for a minute or two to blend well. Then grab your coconut milk and stock and allow it to come to a bubble. Try to not let it to boil, if you see it beginning to boil, lower the heat setting. Simmer for around 10 minutes, then stir in the brown sugar, fish sauce, and your lime juice. Give it a taste, and if needed drizzle in more lime juice, and sprinkle with cilantro and serve. You have a handful of options when serving up your Thai turkey curry. Rice | You can do a scoop of rice, that you have as the bed to your curry. If you want a lower carb dish, reach for cauliflower rice as well. You can make your own or buy it in the fridge or freezer section. Naan Bread | Pair it with Naan bread for dipping and cleaning up all that flavorful sauce. Cucumber Salad | To help bring in some cool to the heat of the curry and freshness. Chapati Bread | This is an unleavened flatbread that many use to eat with chicken curry. Since the turkey offers such a similar taste, it would make tasty serving bread. This curry is such a simple and easy meal to prepare and serve up. Taste better than ordering takeout from your favorite restaurant, and you end up with leftovers by making it at home! You can easily swap the turkey for chicken if you have leftover chicken on hand. 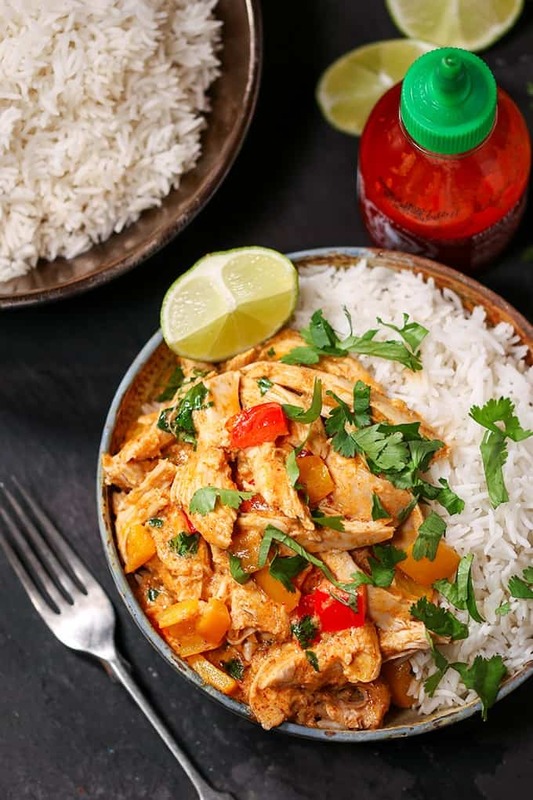 Either way, this Thai Turkey Curry will please your taste buds. 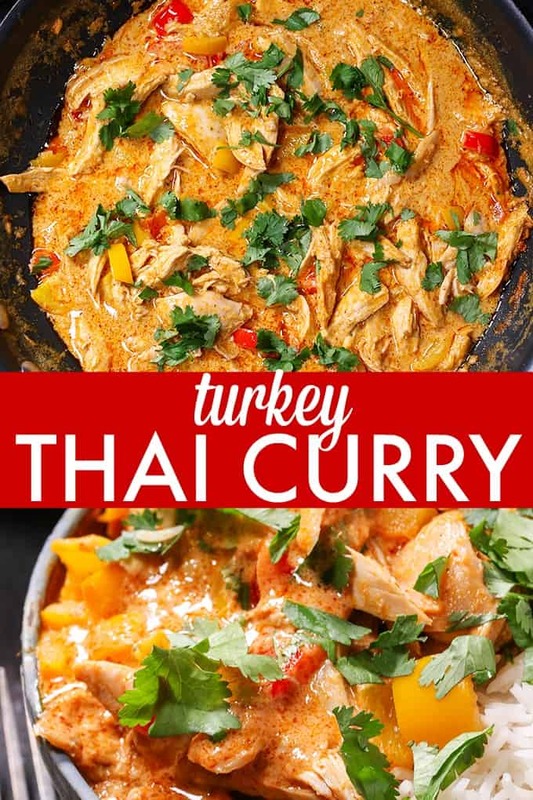 Have you ever made a Turkey Thai Curry before? A brilliant way to use up your Christmas leftovers! Get dinner on the table in less than 20 minutes. Heat the oil in a large skillet and add in the chopped red and yellow peppers. Cook on a medium heat for two minutes, then add in the garlic, ginger, lemongrass paste and cooked turkey. Stir gently for one minute, then add in the curry paste. Stir to coat the chicken and allow to heat through for one minute. Add in the coconut milk and stock and bring to a gently bubble (but don’t let it boil). Let it simmer gently for 10 minutes, then stir through the brown sugar, fish sauce and lime juice. Taste and add more lime juice if required, then turn off the heat and sprinkle over the chopped cilantro. Serve immediately with boiled rice, lime wedges and extra cilantro. Looks amazing! I’m into cooking with coconut milk right now, so this is a good recipe for me. Great photographs as well! Thanks for sharing. This looks so delicious! I pinned it! One of my New Year’s Resolutions is to try new recipes, so I’ll hve to add this to my list! This recipe looks so appetizing, pinning it! Thai Curry chicken is good also!!! This looks yummy! I love Thai food but would never have thought of making this, thank you for the recipe! Making this tonight. Thank you for sharing. Super easy and beautifully explained. 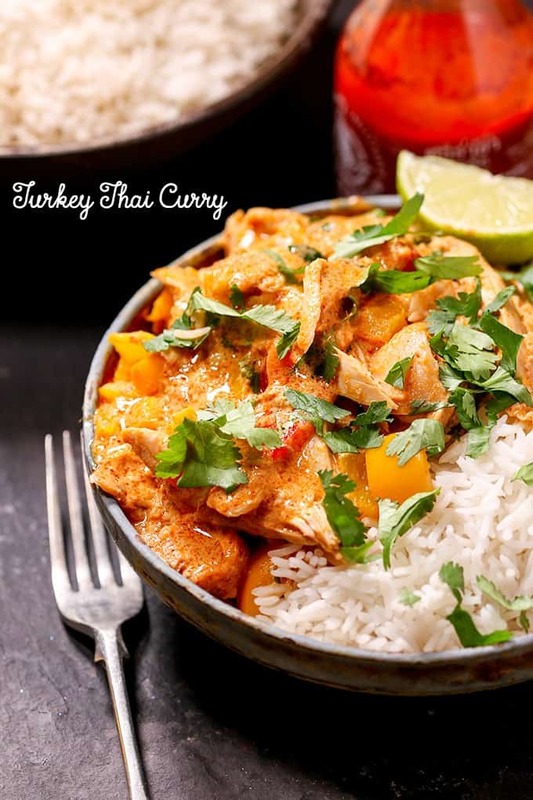 Your Turkey Thai Curry looks amazing! Thanks so much for sharing with Full Plate Thursday and Happy New Year! Look DELISH!!! Thanks for sharing with us! I found you through Silver Pennies Sundays. I will visit again! Yum, this looks like a fantastic way to use some leftovers! I go crazy for curry! I’ve never made turkey curry before, but your recipe looks so good, I may have to try it. Such a great way to use up leftover turkey. Who wouldn’t enjoy comfort food like this after a long hard day of work. this looks sooo good! I LOVE curry! !